“Mindfulness is the process of actively noticing new things,” according to Ellen Langer, who has researched mindfulness for four decades. But, when it comes to parenting, it is much more than that. Mindfulness is the capacity to be fully aware and present in the moment. Giving our children our full attention is one of the most important things we can do as parents. The sad reality is that most of us are constantly multitasking and not really focusing on anything. Our minds wander. We are preoccupied with things that may never happen or worrying about what we cannot change in our past. This causes us to feel stressed, depressed and utterly exhausted—not a recipe for good parenting. Americans report having more stress as of January 2017, than at any time in recent history. Admittedly, parenting is stressful, however parents of children with autism report higher levels of stress as compared to parents of children with chronic illness and children with developmental disabilities combined. This means that parents of autistic children could be at a greater risk for anxiety disorders, depression, and even martial stress. Parents often feel a sense of inadequacy in striving to be “perfect” parents to their autistic children. However, mindful parenting recognizes the reality and wisdom of the “good enough” parent. Regardless of our best intentions, we will have times of imperfection and failure. How parents handle these times is an important aspect of mindful parenting. Parents can learn that their child’s actions aren’t a reflection of their parenting skills. Children need to see their parents fail at times, or they will not have a realistic view of what it is to be human. Mindfulness is the not to get carried away with the ruminations of your mind. We create much of our own frustration, unhappiness and tension by all the thoughts (negative and positive) swirling around in our minds. Mindfulness allows you to step back and look at reality versus thoughts. In turn, it allows you to have a little distance and perspective. You are not ruled by your thoughts, but you have control over your actions and reactions to those thoughts. This sense of control is powerful because it can allow you to reduce your stress levels. You can accept what is happening with your child without allowing it to dictate your or your child’s life. The practice of mindfulness can allow you to see your child’s situation as it is. It can help you to be a better self and a better parent. Deep breathing will begin to naturally bring balance to the systems of the body. This balance allows you to be more mindful of the situation which, in turn, allows you to act in a more deliberate way. Whenever you need an attitude adjustment, take a few minutes and count the seconds as you breathe. Breathing intentionally will send oxygen to your amygdala, and focusing on counting will distract your mind from its woes and allow more focus. 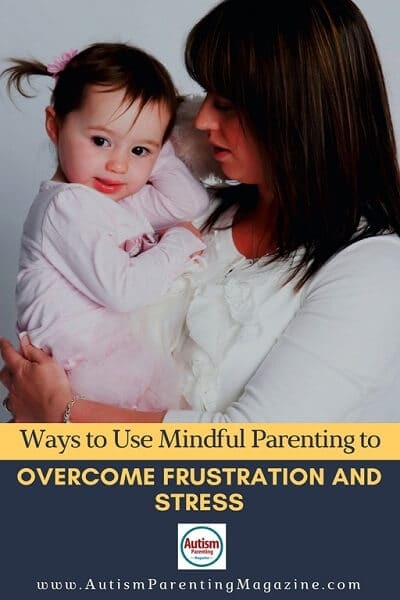 Mindful parenting helps to decrease the child’s aggression and noncompliance while it helps to increase the parent’s’ satisfaction with their parenting skills and interactions with their children. There is no perfect, sure-fire way to parent mindfully. But, there are many ways to practice mindfulness. When you are practicing mindfulness, every time your thoughts wander, you bring them back to be present in the moment. Most things that embarrass you come from mindlessness, such as checking your cell phone when your child is trying to tell you about his day. Mindfulness enables you to see what is happening in your thoughts and not being ruled by them. Being mindful means slowing down, stepping back and observing your own reactions. Slowing life down in general is a common theme that is especially important for parents of autistic children. It makes you stop and think about how you are doing things as a parent. Are you setting things up for success or failure? If you are rushing, trying to pack too much into the morning routine, requiring everything to be perfect, that will only make things worse. It’s alright if your son has toothpaste on his shirt and your daughter has on different colored socks. In striving to be good parents, we often forget what children really need and want. Sometimes, the smallest adjustment in a schedule can change a whole family’s day-to-day life. It’s as simple as practicing paying full attention to our kids, with openness, compassion and unconditional love. These mindful mornings may be less efficient, even less perfect, but they’re certainly less stressful for you and your child. Mindfulness gives a parent the space to breathe and be calm. For example, when your child is having a meltdown, it allows you to step away from your own frustration and to calmly connect with your child. “It helps you to focus on that strong part within yourself. A calm parent usually leads to a calm child,” according to Dr. Bjonbeck. “S– Stop. Whenever you feel stress, simply pause and be aware of it. T-Take a breath. Bring your awareness into the breathing body. Your mind will settle, bringing more clarity. O-Observe. Notice how the breath begins to naturally bring balance to the body. In using STOP, the thoughts that typically swirl through your mind—worries about not being a good enough parent or how poorly your child is behaving in public—will disappear, leaving you alert and peaceful, ready to parent totally, thoroughly, and thoughtfully. So, slow down and enjoy the ride. “Mindfulness in the Age of Complexity,” Harvard Business Review. March 2014 Issue. [Interview with Ellen Langer]. https://hbr.org/2014/03/mindfulness_in_the_age_of_complexity. Retrieved 11//6/17. Miller, Caroline. Mindfulness: How and Why It Works. Child Mind, May 19, 2015. https://childmind.org/blog/mindfulness-how-and-why-it-works./ Retrieved July 12, 2017. Kring, Lisa. The 5 Main Tenets of Mindful Parenting. Huffington Post, October 14, 1013. http://www/huffingtonpost.com/lisa-kring/the-5-main-tenets-of-mindful-parenting_b_4086080.html. Retrieved September 7, 2017. *Bjonbeck, Caroline, MD. Stress Reduction Workshop, June 8, 2017. Dr. Bjonbeck is the owner of Bjonbeck Holistic Medicine and Acupuncture in LaPorte, IN. Garey, Juliann. Mindful Parenting: Use Mindful Techniques to Take Stress and Anxiety Out of Raising Kids. Child Mind Institute. https://childmind.org/article/mindful-pareting-2/ Retrieved July 12, 2017. “Stress in America,” American Psychological Association, February 1, 2017. Http://www.apa.org/news/press/releases/stress/index.aspx. Retrieved July 12, 2017. Ferraloli, S.J. and Harris, S.L. “Comparative Effects of Mindful Responsibility and Skills-Based Parent Training Programs for Parents with Children with Autism.” Mindfulness (2013), 4:89 doi.10.1007/512671-012-0099.0. Vol. 4, Issue 22, pp. 89-101. Garey, at . https://childmind.org/article/mindful-pareting-2/ Retrieved July 12, 2017. Goldstein, Elisha, MD. (2012) The Now Effect: How This Moment Can Change the Rest of Your Life, Simon & Schuster, New York. Wallace, A., B. . (2006). The attention revolution: Unlocking the power of the focused mind. Somerville MA, USA: Wisdom Publications. Tips for Mindful Parenting, https://www.mindbodygreen .com/0-2333617-practices-to-be-a-calm-mindful-parent-even-when-life-gets-crazy.html. Retrieved September 6, 2017. *NOTE: The author attended Dr. Bjonbeck’s workshop (or seminar) on Stress Reduction on 6-8-17. Sher personally works with parents of children with autism and has good results in her holistic approach.